DHAKA, May 10 2013 (IPS) - Last month, 18-year-old Shapla was just another one of thousands of garment workers employed in a factory in Savar, a suburb of Bangladesh’s capital Dhaka. Today she is a handicapped survivor of one of the worst industrial accidents in history: the collapse on Apr. 24 of the massive Rana Plaza, a building housing five factories, that buried scores of workers under a wave of cement and glass. The death toll reached 996 on Friday, though officials and families are still counting the bodies and searching for others beneath the rubble. “I am desperate about the future,” Shapla said, echoing the sentiments of hundreds of female apparel workers like her who lost their limbs on that fateful day. 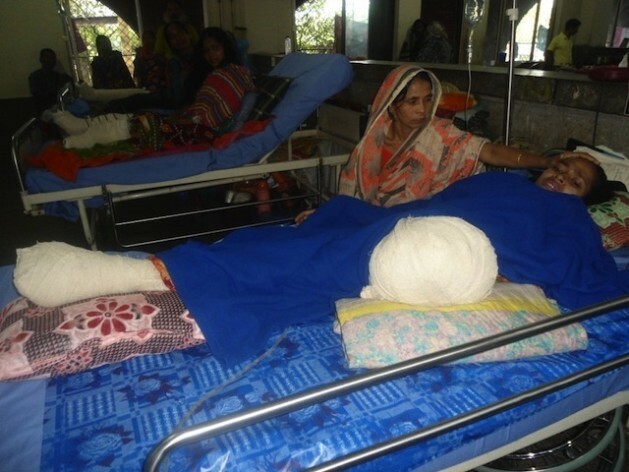 The young mother is now recovering in a hospital in Dhaka after her hand was amputated. Having survived the collapse, Shapla is considered one of “the lucky ones”, but she is loath to see the bright side, as her handicap will almost certainly prevent her from finding work. Experts say that women, who make up 80 percent of the workforce in this country’s booming garments industry, have borne the brunt of this tragedy. According to initial reports, over 80 percent of those who lost lives and sustained injuries in the collapse were women. “They are now socially and economically heavily disadvantaged,” said Mashud Khatun Shefali, founder and head of Nari Uddung Kendra (the Centre for Women’s Initiatives). A leading advocate for female garment workers’ rights, Shefali says her organisation, which has lobbied for better conditions such as safe housing for workers, is now focusing on helping female survivors overcome the trauma of the accident. A woman named Nazma Begum, whose legs have been amputated as a result of her injuries, told a local television station this week that she “worried incessantly” about how she would handle her disability, until her husband assured her of his continued support and love. Over the last decade, Bangladesh – a country of 150 million of which 49 percent live below the poverty line – has become a crucial player in the international apparel trade by providing a vast supply of cheap labour. Bangladesh’s garment industry is now the third largest in the world after China and Vietnam, bringing in 20 billion dollars or roughly 80 percent of the country’s annual foreign exchange. Major apparel companies based in the West and wealthy Asian countries like Japan and South Korea began shifting their production centres to Bangladesh when old manufacturing hubs like Thailand began to raise wages. Mass-produced and bargain clothes that include such labels as Gap, Primark, HMV, Walmart, Sears and American Apparel are all manufactured here and then sold in the importing countries. Businessmen like Zahangir Kabir, owner of the Dhaka-based Rahman Apparels, agree that garment workers are forced to labour in tough conditions, but claim that employers, too, are “under heavy pressure”. He told IPS smaller garment companies like his are expected to meet high trading standards or else accept huge losses. Kabir owns two factories - one for sewing and the other for denim washing - on the crowded outskirts of Dhaka. His 500 employees, the majority of them women, produce clothing such as jeans and denim jackets for European and U.S. markets. But the strict quality standards and deadlines imposed by parent companies in the West often cannot be met in Bangladesh. “Unexpected political upheavals and regular power outages mean we cannot deliver goods cheaply or meet deadlines. Even a slight default allows the buyer to reject our products,” he explained. While Bangladeshi suppliers work for the promise of tidy profits, they also face massive risks in the “cut-throat capitalist market”. “This is the key reason businesses are reluctant to support higher labour standards, including higher wages, for the workers,” he said, adding that he welcomes stricter monitoring of the industry. More than 5,000 factories employing over 3.5 million workers are packed into high-rise buildings in Dhaka and outlying districts, operating round the clock. The biggest to the smallest of these factories are staffed by mostly young women hailing from rural areas, who come to the cities in the hopes of acquiring skills they have no access to in Bangladesh’s agricultural regions. When they arrive in the city, they often live together in close quarters, sharing bathrooms and food. Uneducated and illiterate, these women have few means by which to earn a steady income; their vulnerability makes them easy prey for manufacturers who claim that, in order to remain “competitive” on the world market, they must hire the cheapest possible workforce. According to Shefali, young women often start off as interns, meaning they do not receive a wage but instead labour for a stipend that can be as low as a dollar per month. Within a year, they move on to operating more sophisticated machinery and drawing a regular salary, she added. Most women sew, wash and pack garments for roughly 30 to 40 dollars a month, working a daily average of 10 hours, seven days a week. In contrast, men tend to be hired for high-level positions, such as quality control and management. The garment sector has been hailed as one of the country’s biggest employers, bringing a steady wage to thousands of women. But a string of tragedies has recently highlighted the hazardous nature of this work. Last November, over 100 garment workers perished in a fire in the Tazreen Fashion Factory on the outskirts of Dhaka. Survivors of that tragedy claim they tried to escape, but were locked in by the factory managers. Similarly, on Apr. 24, employees were threatened with dismissal if they failed to come to work, despite warnings that the eight-storey building, which only had a permit to house five floors, was unsafe. A week before the incident large cracks had begun to appear on the ceilings, prompting engineers to issue warnings that a collapse might be inevitable. Negligence of workplace safety is just one of many labour violations women workers face. Sometimes they are forced to work 14-hour shifts in order to turn around a quick profit for the factory owners. Still, activists point out that in a Muslim country with high poverty rates, the garment industry provided a rare opportunity for women to leave their homes and raise their status from housewives to breadwinners. This increased economic independence enabled them to exercise more autonomy in their own lives, to choose their own husbands and enter into marriages on more equal terms. But the Savar tragedy has dealt a hefty blow to this hard-earned status. Sharmin Huq, a retired professor at the Dhaka University who specialises on the handicapped sector, fears that social discrimination will make life harder for women than ever before. Those who survived the tragedy will likely lose their jobs, as their injuries will prevent them from performing at the level demanded by factory owners. This includes support for everything from acquiring artificial limbs to accessing regular counseling to deal with the trauma of the tragedy. than overturned the sexual division of labour at work. Rana Plaza is a gender issue!